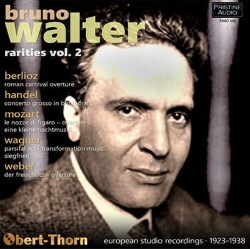 The second volume in Pristine’s series devoted to Bruno Walter’s rarities covers the late acoustic period to the eve of the Second World War and Walter’s flight from Vienna to Paris, thence of course to America. Volume 1 in the series covered those American years (review). As Mark Obert-Thorn makes clear in his Producer’s Note the majority of items have seen brief reissue in Japan or France but one is published here for the first time. One restoration is anomalous. The 1923 Berlioz Roman Carnival rightfully belongs in the two discs devoted to Walter’s Polydor 78s (PASC 142 and 342) but takes its place here instead. This late acoustic is significant as Walter never returned to it in the studio. It’s of some interest that Walter’s 1923 Polydor recording with the Berlin Philharmonic should follow relatively closely that of Arthur Nikisch, in 1920, with the same orchestra. Perhaps Polydor suspected they’d identified Nikisch’s successor. The advance in technology is graphically illustrated in the Wagner items recorded in London in 1925-26. The early electric Parsifal Act I Transformation Music with resonant bells and spatial studio depth reflects well on the engineers’ balancing in Columbia’s Petty France studio which was not always the most sympathetic of venues in the 1920s. The Siegfried Idyll from a year later spread over four 78-rpm sides and revisited the acoustic recording he’d already made of the work. Whilst recorded in London with the (pre-Beecham) organization called the Royal Philharmonic Orchestra this performance was shipped to Columbia’s American arm for issue. Perhaps Columbia didn’t want to compete, for some reason, with their own earlier 1921 acoustic of the piece with the London Symphony and Albert Coates. The orchestra’s characteristically pervasive portamenti were reflective of British string performance practice of the time. The Mozart items are of considerable interest, especially the overture to the Marriage of Figaro. This was recorded in Paris in 1928 with the Mozart Festival Orchestra - the orchestra of the Paris Conservatoire in reality. It was never issued and only a test pressing survives which is what we hear. Fortunately, it’s in fine estate. “Eine Kleine Nachtmusik” was recorded back in London with the British Symphony Orchestra. Oscar Fried may have beaten Walter to the status of discographic pioneer in this work but Walter brings warmth and humanity and indeed, as noted by Obert-Thorn, a big Luftpause in the opening movement, a very stately Menuetto and a crisp and dramatic Rondo finale. The Handel Concerto Grosso comes from much later, May 1938, and back across the Channel with the Paris Conservatoire. Walter employs a harpsichord and there’s real lyricism in the central Larghetto. At the same time he re-recorded Weber’s Der Freischütz overture; it is, in fact, faster than the acoustic version on PASC 482 but his record company in 1938 was more parsimonious and cut the three sides of the acoustic performance to two for his 1938 electric. All the transfers sound well, whether acoustic, acetate or more conventionally electric. Walter’s pre-war legacy which, with one or two notable exceptions was for so long largely ignored, has now been given the respect it most certainly deserves.